Find unique gift ideas, from personalized steins to growlers and tankards. You'll find firefighter mugs, wedding steins and so much more! Engrave them for a great personalized touch. A large selection of gift items for under $25. Great gifts for the beer-lover. These beer steins, mugs krugs and growlers make great gifts. We have a large choice in the $25-$75 price range. Uniquely crafted tankards, beer steins & other gift ideas from $75 for the beer lover in your life. 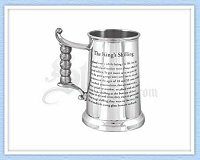 Features the English Navy story of The King's Shilling and has a double lined glass bottom with shilling replica coin inside. © 2019 Steins.com. All rights reserved worldwide.